Fat Face is an incredible clothing manufacturer with nearly three decades’ experience channeling the irreverent, laid-back styles of surf and ski culture. From hats to hoodies, Fat Face is all about accoutering the life lived outside the mainstream, so if you’re looking for clothing that taps into some effortless cool, you can’t do better than Fat Face. Designed with fun and frivolity in mind, yet constructed from robust, high quality materials, Fat Face goods are renowned for their durability and their quality construction. With more than 200 shops across Ireland and the UK, simply find your local store, pick up a voucher code and get shopping to save a fortune on this fantastic lifestyle label. Men, women and kids are all catered for, with a wide range of clothing, footwear and accessories on offer to help you craft your ideal wardrobe. How do I use my Fat Face promo code? 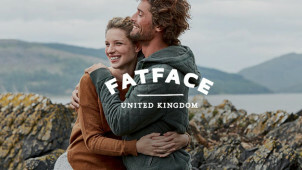 Sign up to receive Fat Face’s newsletter and be the first to hear about news, deals and discounts. Do students get a discount with Fat Face? In association with Student Beans, Fat Face offers a 10% discount for all students. See here for more details. Can I buy a Fat Face gift card? Fat Face gift cards make for the perfect present. If you know someone who loves Fat Face but aren’t sure what to get them, a gift card could well be the solution. Do Fat Face offer a military discount? Those serving in the military can benefit from a 10% discount from Fat Face. Phone: +44 (0)330 124 0000.
International Delivery takes between 5 - 12 days. You can return your goods to Fat Face in their original condition within 30 days of delivery. Inspired by the radical lifestyles of extreme sports enthusiasts, Fat Face offers a stylish aesthetic for those living life outside the box. Grab a Fat Face discount code today and see how much you can save on this amazing brand. Fat Face is a distinctive label known for the casual cool of its stylish clothing, so wear your personality on your sleeve with some Fat Face. Fat Face was founded in 1988 by two ski-bums who had the bright idea of starting a clothing label to pay for their ski passes. Splitting their time between selling t-shirts and hitting the slopes, the pair realised how much they loved outfitting people in their cool designs. Nearly thirty years later and the pair are still at it, with Fat Face a universally-loved brand offering effortless style to millions of trendy customers worldwide. Using off-piste Alpine-design as its main inspiration, Fat Face offers a wide range of great apparel for the colder months. From woolie hats to wax jackets, Fat Face has everything you need to keep warm whilst looking cool, and with a Fat Face promo code you can get your wardrobe winter-ready without breaking the bank. From cosy knitwear to stylish scarves, you’ll be craving the colder weather when you shop with Fat Face.